Part of The Christian Chronicle’s “One Nación Under God” special project. Rocky Mountain Reunion touts unity — in English and Spanish (reporting from Westminster, Colo.): A bilingual worship assembly brings together Christians in northern Colorado, regardless of language. WESTMINSTER, Colo. — “Amen! Amen! Amen!” said a chorus of voices that echoed through the Northwest Church of Christ auditorium as visiting minister Steven Curo preached from 1 Corinthians 1:18. Seconds later, Curo repeated the same verse about the message of the cross being foolishness to those who are perishing but the power of God to those who are being saved. Again, a hearty round of “Amén! Amén! Amén!” followed the Scripture reading — only this time with distinct Spanish accents. Curo alternated between English and Spanish as he delivered a bilingual sermon at the recent Rocky Mountain Reunion — an event designed to improve unity among Christians in northern Colorado. Colorado is one of seven states with a Hispanic population of at least 20 percent. 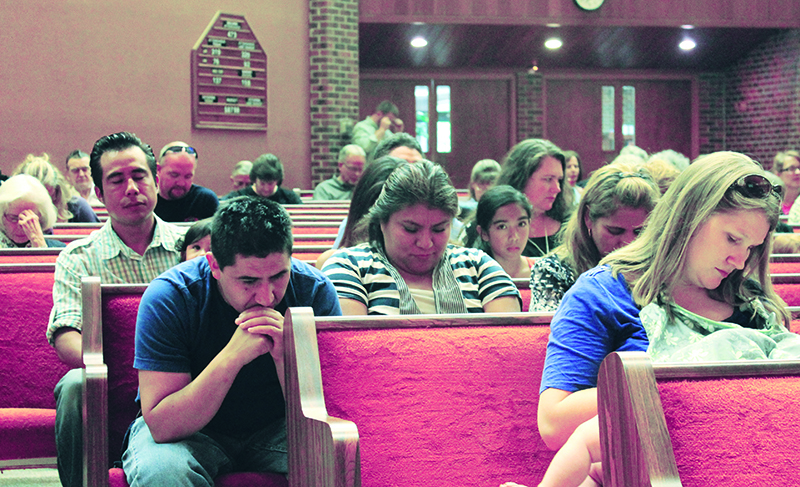 This story appears in the September 2014 print edition of The Christian Chronicle.